WEST HOLLYWOOD, Calif. - The bullet is still there in Cris Kirkwood's back, a permanent reminder of how bad it got for him. He was outside a post office in Tempe, Ariz., that day in 2003 when he exchanged words with a woman who complained about his parking. Then he got into it with a security guard who intervened. Kirkwood, who weighed more than 300 pounds and was in the grip of heroin addiction, grabbed the guard's baton and hit him with it. As the struggle continued, the guard drew his gun and fired. Kirkwood says he surprised the doctors by suffering no motor damage in his lower extremities. He got 18 months in prison for assault. That was bad, but the low point had come five years earlier, when his wife, Michelle Tardif, died in their bedroom from a drug overdose. In comparison, Kirkwood's arrests, the broken relationships, the physical damage, and his fall from the pinnacle of indie-rock prominence as a member of Meat Puppets didn't seem like so much. Not that it sobered him up. Even by the standards of rock-lifestyle excess, Kirkwood's story ranks as extreme. Instead of the copilot of one of alternative rock's most admired and influential bands, he became known mainly as one of its notorious casualties. His brother Curt, the Meat Puppets' singer and guitarist, certainly didn't hold out much hope. ``I completely [wrote] him off years ago. A junkie, you don't deal with them at all, it doesn't do you or them any good." Cris shows a faint smile as he listens to his brother's harsh evaluation. They're sitting in their van in front of the Troubadour in West Hollywood. It's a stop on a tour that brings them to the Middle East in Cambridge Thursday. ``I don't know about reclaiming anything, but definitely to be able to just do this again, it's a . . . riot," says Cris Kirkwood, who began willing himself back toward a functional life after leaving the Federal Correctional Institution in Phoenix in mid-2005 and is now a Meat Puppet once again. ``Me and him together have a weird thing - it's a really neat thing," Cris adds, looking at Curt. ``There's a certain place you can get to. It was a thing that happened live a lot. Like the audience and some weird energy would get going and suddenly you'd get to this trippy place that I really dug." The bassist's return has re-animated one of rock's most colorful entities, a freewheeling outfit with a wild-eyed vision and a disregard for musical borders. Starting in 1980, the Kirkwoods and drummer Derrick Bostrom made music that evolved from punk to Grateful Dead-like folk-country. With their desert origins, surreal imagery, and exploratory impulse, they were invariably tagged as pioneers of post-punk psychedelia, and their mind-bending ways have been adopted and absorbed into the fiber of rock. 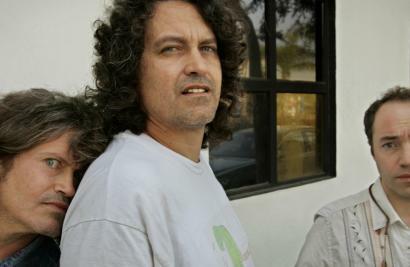 You can hear their influence in such artists as the Pixies, Beck, and Queens of the Stone Age, but the Meat Puppets' most notable fan and patron back then was Kurt Cobain, who performed Meat Puppets songs ``Plateau," ``Oh Me," and ``Lake of Fire," with backing from the Kirkwoods, on Nirvana's 1994 ``MTV Unplugged" album and telecast. Mike Watt, who played bass in the Minutemen, is one of the old cohorts who has dropped by to welcome back the Meat Puppets. ``Personal problems were probably in the way before," says Watt, reflecting on his friends' return. ``You have to grow up a little, and you get those problems subdued and you can get back to your aesthetic that you started off with. ``A band is like a little country, a little political organization - of course you're going to have schisms and stuff. But if you weather it you can come back, especially if you hit upon a sound that was unique and genuine." Cris Kirkwood looks like he's been through it. He's 46, but from his lined and weathered face you would guess a decade older. But he's down to 175 pounds, and he has some teeth now to replace his addiction-destroyed originals. He's clear-eyed and present, without any of the robotic remoteness that often accompanies recovery. He says he's not hesitant to answer questions about his difficult times and at the end of the interview he asks, with disarming sincerity, ``How did I do?" When he felt strong enough, Cris made contact with Curt's son Elmo, who's 23 and opening the Meat Puppets' shows with his band, Kirkwood-Dellinger. When Curt got word that his brother seemed to be back, he took what he calls a leap of faith. ``I just went, `OK, you're rehabilitated. Let's bury the hatchet totally.' . . . As good as I am at burning bridges, I'm as good at burying hatchets, and I don't hold grudges, so I was just like, `Let's move on. The past is dead.' "
During Cris's absence, Curt had meandered, physically and musically. He spent a couple of years in the Los Angeles area and now lives in Austin, Texas. He made a Meat Puppets album with other musicians, formed a short-lived group called Eyes Adrift with Nirvana's Krist Novoselic and Sublime's Bud Gaugh, and released a solo album, ``Snow," in 2005. With Cris back, it didn't take long for the brothers to jump-start the Meat Puppets. Ted Marcus was brought in on drums to replace the retired Bostrom. Their album, ``Rise to Your Knees," came out last week on the small Anodyne label. ``That's something that you can't really think about, we can't practice it," Curt says. ``What actually happens is more like that kind of chemistry."